You know when you're really sick and you are sitting at home coughing your lungs up and unable to focus on your architecture assignment for more than 15 minutes at a time? And you're downing Lempsip like a crack addict and wondering how many painkillers you can take over the top of each other? 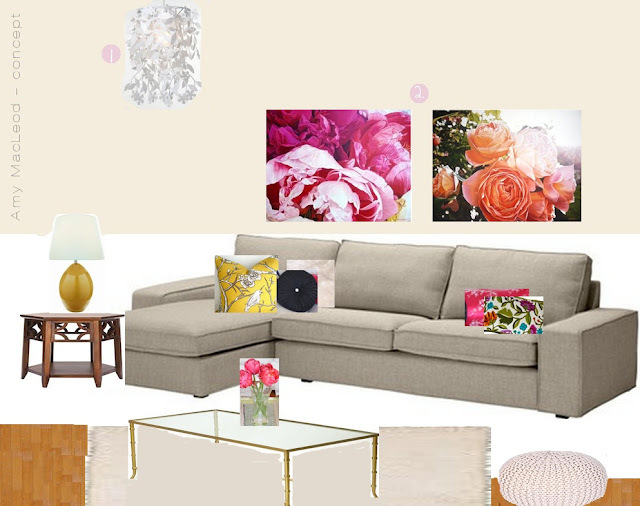 And the internet is being super unreliable but you can't help yourself from throwing together a moodboard because in between homework procrastinations, you accidentally redesigned your whole lounge room? And when I say 'redesign' I mean rip everything out, win a bazillion dollar makeover spree, and start over. Our current lounge room (which you can see here in our home tour) is a pretty nice room, but there are definitely things I would change. For one, the walls need a shade of off-white that isn't going to accentuate the orangey-wood-floors. And then there's the humongous white couch which is just massive and so stark that everything else looks dirty. It can take a long a time to learn your signature style. Maybe it's because I am sick and kinda crazy-stressed over the final weeks of my architecture course, but I am craving me some warm, cosy, inviting, and dare I say it possibly slightly beigey interiors. Splattered liberally with colours and textures and patterns of course. The one above is pretty much my fantasy right now. The artwork I've used here are by our good friend Rochelle Andrews - she does the biggest most gorgeous close-up and photo-like flower paintings ever - check her out! Oh god. I have so been there. It's wonderful to hear you're putting your sickness induced deliriousness to good purpose! Definitely trust anything your mind tells you in this state, definitely. Pain killers and head cold and stress lead to really good, healthy, normal thoughts. So like, be careful and don't trust anything your brain tells you.